The hypothesis of early metastasis was debated for several decades. Dormant cancer cells and surgery-induced acceleration of metastatic growth were first observed in clinical studies and animal experiments conducted more than a century ago; later, these findings were confirmed in numerous modern studies. 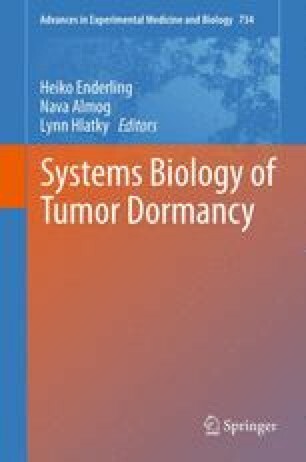 In this primarily methodological work, we discuss critically important, yet largely unobservable, aspects of the natural history of cancer, such as (1) early metastatic dissemination; (2) dormancy of secondary tumors; (3) treatment-related interruption of metastatic dormancy, induction of angiogenesis, and acceleration of the growth of vascular metastases; and (4) the existence of cancer stem cells. The hypothesis of early metastasis was debated for several decades. Dormant cancer cells and surgery-induced acceleration of metastatic growth were first observed in clinical studies and animal experiments conducted more than a century ago; later, these findings were confirmed in numerous modern studies. We focus on the unique role played by very general mathematical models of the individual natural history of cancer that are entirely mechanistic yet, somewhat paradoxically, essentially free of assumptions about specific nature of the underlying biological processes. These models make it possible to reconstruct in considerable detail the individual natural history of cancer and retrospectively assess the effects of treatment. Thus, the models can be used as a tool for generation and validation of biomedical hypotheses related to carcinogenesis, primary tumor growth, its metastatic dissemination, growth of metastases, and the effects of various treatment modalities. We discuss in detail one such general model and review the conclusions relevant to the aforementioned aspects of cancer progression that were drawn from fitting a parametric version of the model to data on the volumes of bone metastases in one breast cancer patient and 12 prostate cancer patients.